This award scheme, sponsored by Kellogg's, is designed to motivate and reward achievements of swimmers at any age or level. Through the scheme swimmers can collect badges and certificates when they have successfully achieved the required standard in terms of developing new techniques, achieving times or distances. 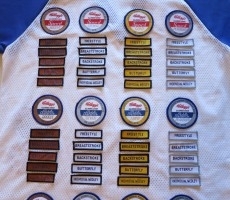 These awards can be achieved in competition or Club Championships held at the club. Award times are consistent with the ASA Graded Swimming Times. Gold Standard is approximate to average county age group qualifying times for 12 year old boys. When this level is reached, there is a good chance that these swimmers would qualify at county level. 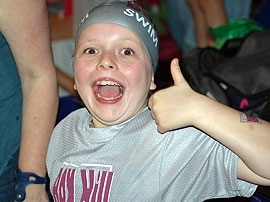 There is no upper or lower age limit - swimmers of all ages can achieve an award. 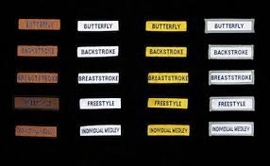 Times are graded at four levels: Bronze, Silver, Gold and Platinum with a separate award for each stroke. Once the swimmer achieves a time at that level for any stroke, they can claim the round badge that relates to the distance (Sprint, Middle, Distance) and the relevant stroke flash, then collect further flashes as times are achieved for each stroke of that distance. See your PB (Personel Best) times and check against the badge time. These times are updated after every competition. S next to times means you swam the time Short Course (25m pool). L next to times means you swam the time Long Course (50m pool). If you dont see a time for an event it means you have not competed in this event. CAN I GET AN AWARD RETROSPECTIVELY? If you have a Gold time you can also purchase the Silver award if you wish. If you have a Silver time you can also purchase the Bronze award if you wish. Once you have a Certificate and Badge (£3) for each stroke will then only need a flash (£1.50) for respective distance. Download and complete this form - Hand it to Fiona Hayers or Angie Hector together with correct fee. Badges/Flashes and or Certificates will be available within 7-10 days from placing your order. Display them proudly on your Box Hill Swim Team T shirt!! Ask you Mum or Dad to sew them on. All club swimmers have the opportunity to qualify for the ASA Competitive Swimming Performance Awards whenever they swim competitively. Bronze, silver, gold and platinum sew-on flashes/badges and certificates are awarded to swimmers who attain the times required by the ASA to qualify for the relevant award. 25m -50m -100m are Sprint Awards - Please note Platinum sprint badges are not awarded for 25m, 50m swims and 100m IM. Keep a record of which awards you have achieved - Download and print this form. ASA Competitive Swimming Performance (CSP) Award Times.